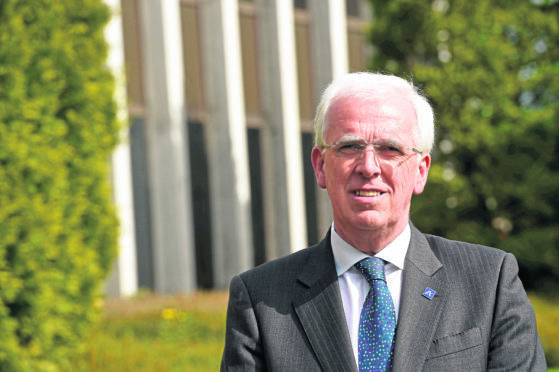 Councillor Jim Gifford, leader of Aberdeenshire Council, has called for an overhaul to the current local government finance system. Council chiefs claim a drastic overhaul of local government finance is needed if they are to cope with increasingly tough economic times. Aberdeenshire Council’s leaders believe the current system is failing local authorities because they are prevented from being able to properly organise their own finances. Jim Gifford said that the late timing of the vote on Derek Mackay’s Budget announcement – which took place earlier this month – had undermined the ability of finance chiefs to properly plan ahead. And the council leader branded much of the finance minister’s budget as “back of the fag packet stuff”. Mr Gifford’s comments came following the revelation on Thursday that the council could potentially axe 150 jobs as it attempts to overcome a £27 million deficit. And while residents already knew they faced a 3% increase in council tax, there was also the unwelcome possibility of a further 1.79% increase that would generate about £2.3 million for the cash-strapped authority. The council leader said yesterday: “What needs to be changed is the thing that’s most difficult for the Scottish Government to do. And that’s change the process. “The process needs changed so that we are not having this last minute deal to get their budget through, it’s not helpful to anybody. “And what we’ve seen over the past few days is some of it it was down to the last minute back of the fag packet stuff and whether it’s ever going to see the light of day remains to be seen. “These things coming through in a hurry and in a rush doesn’t help with good, sensible and stable financial management. If they can’t do that, we can’t do that either. “Finding some way to change the system so we get a more long-term structured way of getting finances delivered to us would be helpful. “In fact, it’s essential, because it’s getting harder and harder every year to do this because of the last minute nature. Aberdeenshire Council has a revenue budget for the next year which amounts to £565 million, with the local government settlement sitting at £422 million – making it one of the three lowest-funded authorities. It is looking at a £4 million overspend for this financial year. The council has stressed that is looking to avoid compulsory redundancies but the savings it has calculated it needs will require about 150 posts to be scrapped. Mr Gifford described compulsory redundancies as “a last resort”.